The spell cast by Beyoncé – a performer whose artistry is a fine wine on which we are all drunk – during her performance at yesterday’s Grammy awards shows no sign of waning today. The divine image of her resplendent in gold maternity wear has been seared into our collective retinae, thanks in part to the incredible stage costumes she wore on stage and in the accompanying projections, which were designed by former Roberto Cavalli creative director and Hold Up collaborator, Peter Dundas, who also used the occasion to launch his eponymous label. 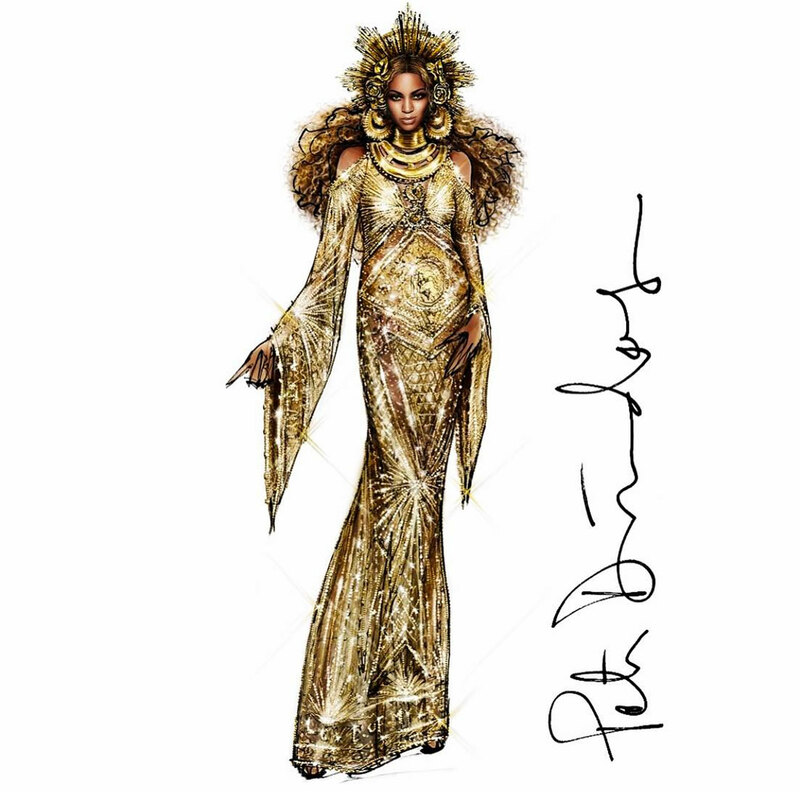 In an interview detailing the process of his collaboration with Beyoncé, Dundas revealed that it took a team of 50 embroiderers working constantly and in secret for an entire week to finish the show-stopping gold number, which draws on an equally-as-gilded art history. Dundas revealed that he was inspired by the art of iconic Viennese artist Gustav Klimt, with motifs also inspired by the Russian-born French father of Art Deco, Romain de Tirtoff, who worked under the mononym Erté until his death in 1990. It’s only fitting that Dundas should cite Erté as inspiration for his solo outing and rekindled collaboration with the performer. Erté first gained recognition as a fashion designer working in Paris before World War I, designing costumers for the dancer-turned-spy Mata Hari. Between 1915 and 1937, he came to prominence in the States designing and illustrating the covers of Harper’s Bazaar, where his meticulous designs of stylish women draped in beads and furs would go on to define the aesthetic of an era. 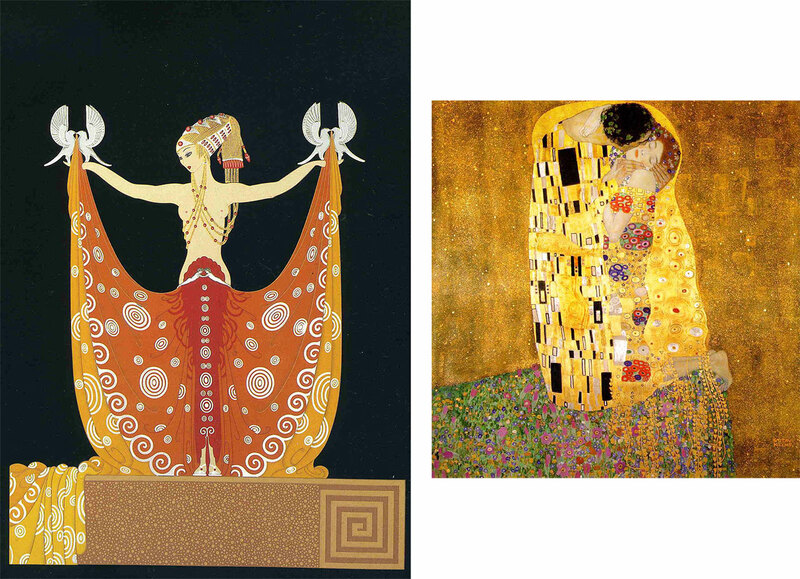 Klimt’s inspiration is perhaps less literal, though nonetheless present in the design’s exquisite ornamentation and its silver and gold applications – traits shared by many of the artist’s most famous works, including the gilded Kiss and Mother and Child. ‘Love of my life’, lyrics from the performed song Love Drought, were also incorporated into the embroidery, as were rays of sunlight meant to symbolise the African goddess Oshun, whom Beyoncé also repeatedly invoked in the suite of pregnancy portraits she unveiled the week prior in collaboration with a number of contemporary artists, including Awol Erizku. Dundas added that he wove imagery of two cherubs onto the hips swaddled in – appropriately enough – ivy, with Beyoncé’s face taking pride of place on the centre. Where else?